Extended loan for use by Secretary Louis Sullivan, U.S. Department of Health and Human Services, Washington, D.C., 1989-1992. Extended loan for use by Ambassador Michael Kantor, U.S. Trade Representative, Washington, D.C., 1994-1996. Extended loan for use by Ambassador Charlene Barshefsky, U.S. Trade Representative, Washington, D.C., 1996-1997. European Paintings: An Illustrated Summary Catalogue. National Gallery of Art, Washington, 1975: 104, repro. European Paintings: An Illustrated Catalogue. National Gallery of Art, Washington, 1985: 127, repro. Kellermann, Michel. 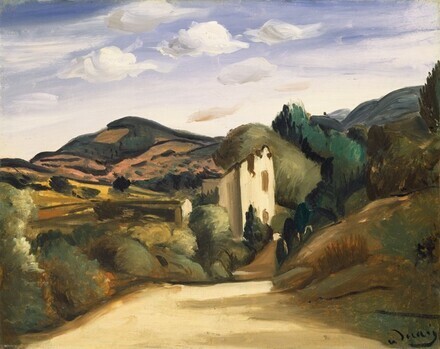 André Derain: Catalogue Raisonné de l'oeuvre peint. 2 vols. Paris, 1992-1996. II:557, repro.